In 1980, a new corporation was formed in the United States: American Coal Enterprises (ACE). To most of us, the first mention of this group was an article in the December 1980 edition of Trains magazine. Headed by financier Ross Rowland, who was well-known for restoring and operating NKP 2-8-4 759, Reading 4-8-4 2101, and C & O 4-8-4 614, ACE was founded to develop practical coal-burning locomotives for modern American railways. The main purpose of this project was to shift American railways from the use of imported diesel fuel to the use of indigenous coal, which is available in abundance in the U.S. (as in many other countries). Fuels derived from crude oil (gasoline, diesel, etc.) had sky-rocketed in price since the oil embargoes of the 1970's. Coal on the other hand, had remained stable in price for some time. The chief design goal of ACE was to develop a steam locomotive which was just as simple to operate and economical to maintain as a diesel-electric locomotive. Earlier in 1980, a meeting had been called to discuss the possibility of re-introducing coal-fired locomotives to America's railways. Present at the meeting were Ross Rowland, William Withuhn, Bill Benson, and L. D. Porta among other technology experts. All agreed that the time was ripe, and plans were made to develop a prototype steam locomotive using advanced technology. Porta had already been considering the possibilityof the need for advanced coal-burning locomotives for several years, and he had a basic design concept ready at the time of this meeting. Porta believed that the development of modern steam locomotives would have to proceed on a step-by-step basis. He was basically the only man in the previous 40 years who had devised any significant improvements for steam and overseen their implementation on actual working steam locomotives, and he was the only man at this meeting with steam design experience. Porta's initial concept for ACE was a fast-freight 2-10-0. This would be a "Second Generation Steam" (SGS) locomotive, and was not expected to seamlessly fit into existing U.S. railway operations. It was intended to (1) be designed and built within 2-1/2 years, (2) pull actual freight trains in revenue service, (3) show that "classical" steam had nowhere near reached the scientific limits of performance or efficiency, and (4) provide valuable design and operating experience for the ACE design team. This locomotive would have been only the first step in the development of the ultimate coal-burning locomotive for U.S. railroads. Unfortunately, while Porta's "vision" was agreed to, things changed over the next few weeks. Other members of the ACE team evidently thought that it was absolutely necessary to produce a 100% sellable machine, even as the first prototype. As a result, the concept for the ACE 3000 we saw in Trains took shape. The article in Trains outlined the basic concept for the engine to be known as the ACE 3000. It was intended to be a coal-burning, steam locomotive which would somehow be made compatible with the modern railroad operating environment. Judging that the EMD GP-40 diesel-electric of 3000 crankshaft horsepower was pretty much the average railway locomotive, the ACE team set out to design a steamer that could effectively compete against it. The ACE 3000 was to be capable of 3000 (nominal) draw bar horsepower (4000 hp peak), an efficient operating speed range of 15 to 70 MPH, have computer-controlled firing, and a typical (not peak) thermal efficiency of 15%. While the ACE team acknowledged that this efficiency was much less than a modern diesel-electric locomotive (which had an efficiency of about 30%), they knew that the immense cost difference in coal and diesel oil would allow a less-efficient coal burning locomotive to be much more economical to fuel than a very efficient oil burning diesel locomotive. It was claimed that the locomotive would be rugged, (relatively) simple, and use only proven technology. Unexpectedly to some, the proposed engine did not feature rotary-cam poppet valves, a 1200 psi watertube boiler, or a steam turbine prime mover. The ACE team carefully studied failed "advanced steam" attempts of the 40's and 50's and concluded that these items had never stood up to the harsh railroad environment, and moreover, were unnecessary to achieve their design goals. The ACE 3000 was to use a reciprocating, 4-cylinder compound expansion piston drive with Walschaerts-actuated piston valves (dual valves on the low pressure cylinders) and a 300 PSI firetube boiler (with Belpaire firebox). Computer control of the multitude of tasks taken care of in steam days by an experienced engineer and fireman would allow a diesel-educated engineer to run the locomotive. Also in 1980, Railfan magazine featured an in-depth article on the ACE 3000 that covered more details of the locomotive. 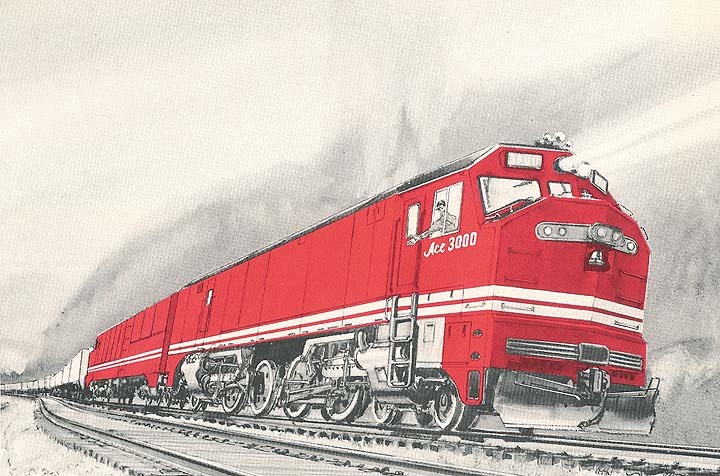 That issue included this drawing by Gil Reid showing an ACE 3000 pulling what looks like a "Roadrailer" intermodal train in in fast freight service. To answer Burlington Northern's request for an efficient drag-freight engine for use on unit coal trains, ACE later proposed an ACE 3000-8 variant, with driven wheels under both the boiler and tender, producing a 4-8-4+4-8-4 wheel arrangement. A separate frame was slung between the two units supporting the coal packs. This locomotive would have had greatly increased starting tractive effort and would have developed maximum horsepower at lower speeds. The ACE patent mentions that two alternative schemes were being considered: one with 4 high pressure cylinders on one unit and 4 low pressure cylinders on the other unit, the alternative arrangement having two engines each comprised of two high pressure and two low pressure cylinders. The ACE team was also investigating reciprocating electric steam locomotives, steam turbine electric locomotives (mentioned in the patent), fluidized bed combustion (which can cleanly burn high sulfur coal), and coal-fired gas turbine electric locomotives. While ACE was the best-known effort of the early 1980's to develop a new coal-fired locomotive, several other companies were also hard at work. See the 21st Century page for information on these projects. In November 1982, an agreement to develop the ACE 3000 prototype was announced by the Chesapeake & Ohio Railroad, the Burlington Northern Railroad, and boiler company Babcock and Wilcox. Plans were to construct two of the "Dash 8" prototypes by spring 1985. The cost of the two Dash-8's was expected to be about $50 million. Burlington Northern had conducted detailed computer analyses comparing the costs of electrifying its western lines which chiefly carried coal traffic. These models showed the financial returns on the ACE to be far superior to those of electrification. After this very promising announcement, very little was said for the next year. Then, on May 25, 1983 a new joint venture was announced called "COALS", which stood for Coal Oriented Advanced Locomotive Systems. This group consisted of Burlington Northern, the Chessie System, and Babcock & Wilcox with ACE acting only as a limited partner. No explanation was given for the change in status, but financial factors and control of the company were undoubtedly important considerations. Realizing that there were several potential foreign markets for new steam, ACE sought to form an "export" division in early 1983. David Wardale, who had turned down an earlier job offer, was offered the position of chief engineer of this division and accepted. Initial plans were to modify the C & O 614 along the lines of the SAR 3450 "Red Devil" to show the potential of improved "conventional" steam locomotives. Very little news was heard until November 1983, when the COALS group broke up due to disagreements about the financial arrangements between Babcock & Wilcox and Burlington Northern. After all the great expectations that had been raised, it was hard to believe the project had failed for what appeared to be short-sighted financial bickering. After remaining dormant for several years, in 1985 ACE came into the spotlight again as oil prices resumed their climb. In a spectacular demonstration of steam showmanship, Rowland brought out his 4-8-4 no. 614 for testing in actual revenue service on the now-CSX Railway in the mountains of West Virginia. The Foster-Wheeler boiler company was brought on board (replacing Babcock & Wilcox) to assist with testing and boiler design. In January 1985, 614 operated under some of the most grueling conditions imaginable (temperatures down to 20 degrees F below zero) in an attempt to provide test data on steam locomotive performance to be used by the ACE design team. An extensive array of sensors were installed on the 614 by engineers from Foster Wheeler and tied-in to recorders located in a test car behind the engine and tenders. The sensors measured boiler temperatures, smokebox gas composition, steam temperatures, cylinder pressures, and rod and frame stresses. These sensors would allow real-time measurements to be made on a working steam locomotive under realistic conditions. Unfortunately, due to the short time allowed for preparation of the locomotive and equipment, and because of the incredibly harsh weather conditions, data gathering was marginally successful. While very little of this data was ever published, one result was revealed by Roland in the 1985 video "Chesapeake & Ohio 614T: The March to Hinton". The early testing confirmed the relatively low thermal efficiency of a conventional steam locomotive like the 614 at about 6%. Amazingly, despite the vast thermal efficiency gap between the 614 and modern diesel-electrics, 614's computed fuel costs were LESS than those of the newest EMD diesels hauling the same trains over the same tracks under the same conditions, due to the extreme price difference in coal and diesel fuel. As Roland put it, if a 6% efficient steamer could haul freight at a lower fuel cost than a state-of-the-art diesel, imagine what an 18% efficient steamer (i.e.- the ACE 3000) could do. Unfortunately, 614T soon experienced severe firebox problems, including cracks, leaking stays, and cinder erosion of tubes, all of which greatly hindered its performance as the tests went on and greatly lowered its efficiency. Likely much of this was caused by the extremely short timetable in which the engine was prepared for the tests, which may have caused some repairs to be sub-standard. A few days into the test, the 614's booster failed, severely hampering her low speed performance. The 6% efficiency rating also appears to have been a peak for 614T during this time. According to David Wardale's book The Red Devil and Other Tales from the Age of Steam, typical efficiencies for 614T were below 4%, and averaged only slightly over 3% for the actual time it was in service. While this was much less than what mainline steam in the U.S. achieved in its hey-day, it did illustrate to the ACE team how far they had to come to produce a cost-effective and thoroughly reliable machine. 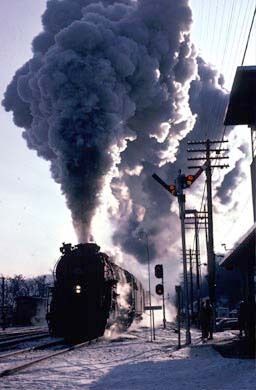 Wardale points out that while the 614 was a well-designed locomotive, its thermal performance was dismal, caused partially by the removal of its feedwater heating system (by the C & O in the 1950's) and by the extremely poor performance of its stack/exhaust nozzle arrangement (which was typical of most U.S. steam locomotives). The final ACE 3000 variation shown in the diagram above, was beautifully illustrated in a painting titled "High-Tech Steam" by Charles Amos, showing an ACE 3000 passing Rowland's C&O no. 614, which appeared in October 1986. This version of the ACE had "standard" cabs in lieu of the safety cabs shown in earlier illustrations. 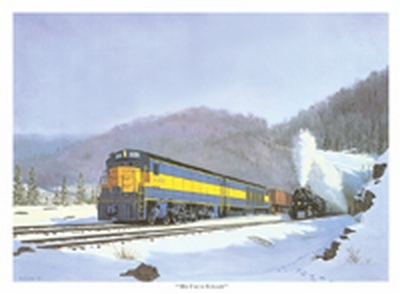 Prints of this painting were available from HistoricRail (no affiliation), but are not listed currently (April 2006). While trying to raise finances to support construction of two ACE prototypes, ACE proposed interim locomotives which could be built less-expensively to prove the ACE concept. ACE had a short schedule, a minimal engineering team, and limited financial resources. Porta and Wardale (the two men on the team with proven steam design experience) convinced Roland that the design and construction of a reliable ACE 3000 with the available resources was not practicable. As a result, the team agreed that Porta's original idea of an SGS prototype was the most viable course. While this started out as Porta's fast-freight 2-10-0 called the "Mark 1" but later renamed the ACE 6000 for its estimated horsepower rating, this soon evolved into a cab-forward 2-10-2 (called the Mark 1-B) with an enclosure to avoid the dreaded appearance of a "classical" steam locomotive. Porta's concept of the locomotive (see below) was considerably more handsome. Wardale thought that this engine still had insufficient low speed power compared to what could be built, and that a design with better low speed performance should be pursued. He reasoned that all railroads so far interested in the ACE hauled coal. For the Huntington-Hinton line that the 614T was tested on, the typical motive power for coal trains was two EMD SD-50's (6 axles and 3500 crankshaft horsepower each). His idea for a steam equivalent to a 6 axle diesel was a 2-6-0+0-6-2 Garratt variant, designated the Mark 1 C. While Rowland had earlier rejected the idea of a Garratt, he saw the merit of this approach and approved it. Porta enlarged this to a 2-8-0+0-8-2 version (the Mark 1G), and all at ACE agreed this was the engine to build. A significant benefit of the Garratt configuration compared to the original ACE 3000 was that a much higher percentage of the engine's weight would be on its driving wheels, making it a more-effective low speed machine. Unfortunately, the Chessie was put off by this shift in ACE's corporate design philosophy, and a sharp drop in the price of diesel fuel greatly reduced their interest in converting to coal fuel, reducing their interest in financing the ACE prototype. While they had already contributed significant funding, (all of which was spent to pay the bills generated from the 614T test runs), Chessie withdrew their support for the project. There were high hopes that the U.S. government, who had set aside millions for projects to produce liquid fuels from coal, would back the ACE project. One of the chief aims of the January 1985 tests was to gain publicity for the project. Unfortunately no federal funds were ever released to ACE. Knowing of China's continued use of main-line steam and their steam construction industry, Rowland tried to interest the Chinese in building full ACE 3000's as well as modernized versions of their existing steam designs for both domestic use and for export to steam-using countries. The Chinese expressed interest, but no more. Later, David Wardale was hired to assist Datong in the design of improved locomotives. Unfortunately, railway management in China had already decided that steam was "backwards" and not in keeping with China's desired image as a modern nation, and nothing came of "new" Chinese steam. Even as recently as the year 2000, it was reported that Ross has not yet given up on ACE, and hopes conditions may someday be right for the emergence of new steam locomotives. One other attempt at constructing an ACE prototype was pursued, believe it or not, by some industrious "live-steam" enthusiasts. In the March 1991 of "Modeltec" Magazine, the editor answers an inquiry about the ACE with the story of how he investigated building a reduced-scale prototype. The editor of Modeltec was involved with the Riverside & Great Northern Preservation Society, who operate a working 15" gauge live steam railroad, complete with extensive shops, in Wisconsin. This group approached a former ACE official in Washington, DC (probably Bill Withuhn) in August 1990 with the idea of building a 15" gauge ACE in their shops at the R & GN. Unfortunately, they were discouraged from attempting this due to some of the costs involved, and the difficulty in scaling down some of the processes and specialized components. Maybe some live steamer will some day take up this challenge. When the men who formed ACE first met, they could see the very real opportunity for the profitable application of state-of-the-art steam power in the U.S. The proposed ACE 3000, while simple in concept, included a myriad of complicated subsystems, including specialized high pressure pumps, boiler drafting fans, and computer controls. This was hardly consistent with the expressed intent to build a simple, rugged, reliable steam locomotive. All this was a consequence of trying to design a steam locomotive which would be marketable to modern-day U.S. railway management. While a typical modern diesel-electric contains many more complicated sub-systems than the ACE would have, initial diesel designs had been accomplished using the vast engineering knowledge of General Motors, and had been perfected over many years before becoming widely accepted by the railways. ACE was only a small company with limited finances and a limited engineering staff. ACE's best hope was to sell their coal-fired locomotive concept effectively enough to persuade someone to back it with massive funding. This would have allowed the required engineering and management resources to be devoted to accomplish the project in a short time frame. Porta and Wardale agreed with Roland that nothing would sell the concept like an actual locomotive burning coal and pulling trains. These men thought that an advanced Second Generation Steam (SGS) locomotive could have been built within their time and budget constraints. While this was not what the American railways were looking for, it may have been a far more effective sales tool than brochures, graphs, and drawings of what could be built. Perhaps such a locomotive would have spurred the necessary interest to finance the ACE project and successfully sustain a steam re-birth in the U.S. ACE 3000 Technical Paper- This ASME technical paper provides a good general discussion of the features of the ACE 3000. ACE 3000 Drawings & Specifications- Detailed drawings of the ACE and a listing of its specifications. Note- very large files and large page arrangement. ACE 3000 Patent- The complete ACE patent, 42 pages including a very detailed description of the ACE 3000 with numerous cutaway drawings and text on the U.S. Patent & Trademark Office database. 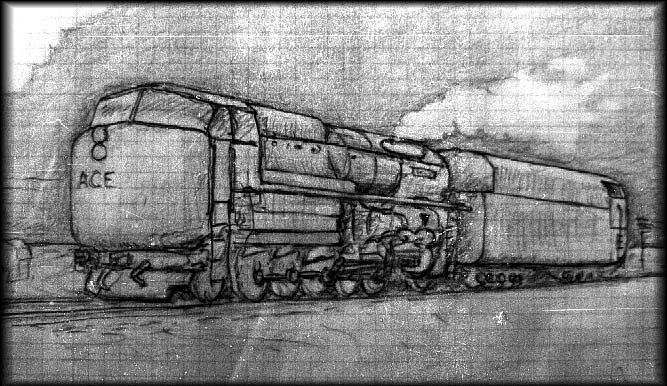 ACE 3000 downloadable drawing- Very nice drawing located at the Railfan Paintshop. ACE 3000 HO Scale Brass Model- Information on a limited-edition hand-built model ACE 3000 locomotive.